I decided to give handmade gifts for a Secret Santa exchange at work since I’m always low on money at Christmas. 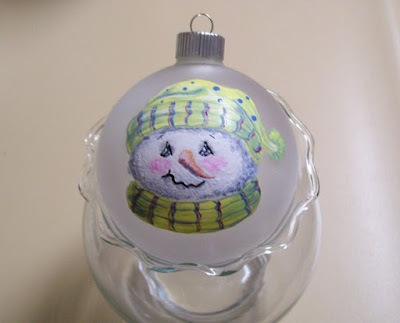 I bought the glass ornaments on sale at Michael’s and painted a set of three, each with a different snowman, using acrylic paints. I didn’t sign them until I gave them all to the recipient so as not to give away my identity, then initialed and put a year on them with a black Sharpie pen. This was a great way to participate in the exchange without breaking the bank!